The Ellen Tracy woman is bold, confident, daring, and spontaneous. A 21st century woman, she cherishes the things that make her feel most alive; good friends, a loving family and new discoveries. 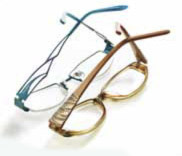 The Ellen Tracy eyewear collection is rooted in the brand's iconic American heritage and offers superior workmanship, classic shapes and exquisite fitting details, tailored to her particular needs. The Ellen Tracy collection is specifically designed to appeal to the Ellen Tracy consumer, women with polished style who appreciate high quality designer fashions. This collection offers sophisticated, elegant and creative fashion sensitive to the patient's needs, luxurious, polished styling with "touch me" textures, harmonious use of color and materials, original designs and modern detail treatments with subtle embellishments.